Kasundi is an exotic version of mustard, made with green mangoes, chilies, and turmeric. It’s a condiment eaten with rice, lentils, curries, boras and pakoras to give them an extra tang. Try Kasundi with sandwiches, hotdogs, burgers, grilled vegetables, or anything that you would normally eat mustard with! 1) Prep the green mango by peeling it and then slicing them into inch long pieces. 2) In a grinder, grind the whole black mustard seed into a coarse powder. 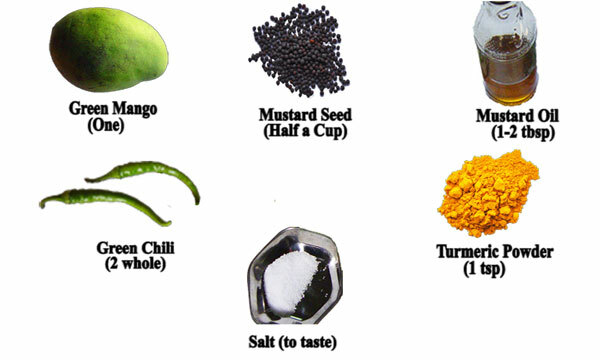 3) Add the mango, green chilies, turmeric powder, salt, mustard oil. 5) Add about a quarter of a cup of water. 6) Continue blending until you’ve made a uniform paste. For long term use, store the Kasundi in a tightly closed jar in a refrigerator.